In the Caribean sorrel drink is made from calyces of the roselle (Hibiscus sabdariffa), a species of Hibiscus native to the Old World tropics, also known as the Flower of Jamaica. In Jamaica and Trinidad & Tobago the plant is called 'sorrel'. 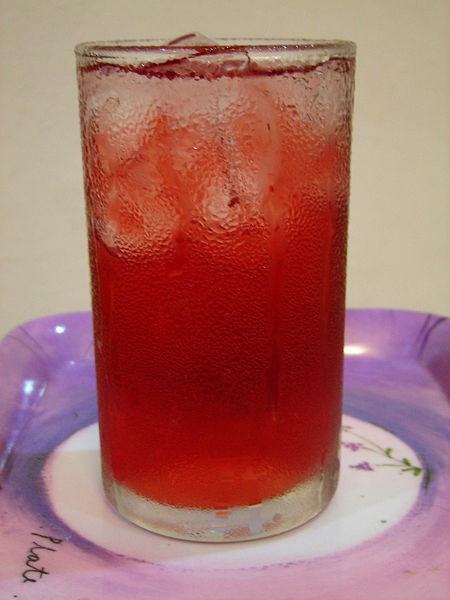 The sorrel drink is prepared by boiling dried calyces of the Flower of Jamaica plant in water for 8 to 10 minutes (or until the water turns red), then adding sugar. It is often served chilled. In Jamaica additional flavor is added by using ginger and rum. It is a popular drink of the country at Christmas time. It is also very popular in Trinidad & Tobago but the ginger is substituted for cinnamon and cloves for added flavour. In Mali, Senegal, The Gambia, Burkina Faso and Benin calyces are used to prepare cold, sweet drinks popular in social events, often mixed with mint leaves, dissolved menthol candy, and/or various fruit flavors. The drink is one of several inexpensive beverages (aguas frescas) commonly consumed in Mexico and Central America, and they are typically made from fresh fruits, juices or extracts. In addition to being a popular homemade drink, Jarritos, a popular brand of Mexican soft drinks, makes a Flor de Jamaica flavored carbonated beverage. Imported Jarritos can be readily found in the U.S.
With the advent in the U.S. of interest in south-of-the-border cuisine, the calyces are sold in bags usually labeled "Flor de Jamaica" and have long been available in health food stores in the U.S. for making a tea that is high in vitamin C. This drink is particularly good for people who have a tendency, temporary or otherwise, toward water retention: it is a mild diuretic. 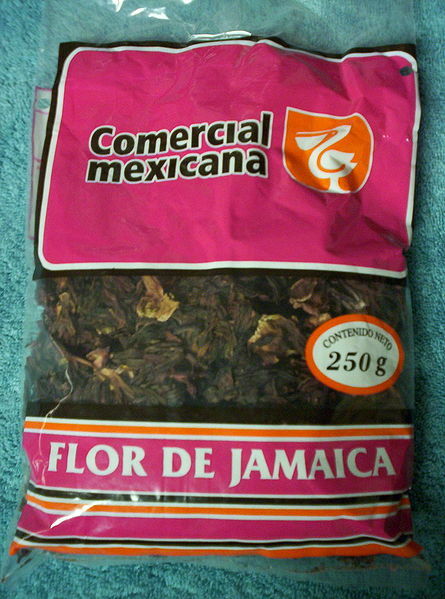 Left: Bag of Flor de Jamaica calyces from Mexico, manufactured by Comercial Mexicana. In the UK the dried calyces and ready-made sorrel syrup are widely and cheaply available in Caribbean and Asian grocers. The fresh calyces are imported mainly during December and January in order to make Christmas and New Year infusions, which are often made into cocktails with additional rum. They are very perishable, rapidly developing fungal rot, and need to be used soon after purchase - unlike the dried product, which has a long shelf-life.